By Eddie Wieber by people's involvement, understanding and use of turbo charging in performance applications." Nick Gramelspacher, VP of Sales & Marketing for Meyer USA, predicts that lighting and Jeep products are at least two areas that will see significant growth in the coming year. Expect to see plenty of new Jeep Wrangler parts at the show, Gramel- spacher says. Education & training A comprehensive curriculum is planned at THE SHOP SHOW, available free to show attendees. For example, Vibrant Per- formance will lead a seminar on fabrication techniques that includes both introductory and advanced how-to information. Other topics include: • Engine tuning • Coolant technolog y • Weatherstripping • Hot Rod industry panel • Marketing for your shop • Dealership-driven revenue • Paint spraying • Chrome wheel (PVD) basics Also planned are informative business sessions, including seminars on online mar- keting , social media and public relations. 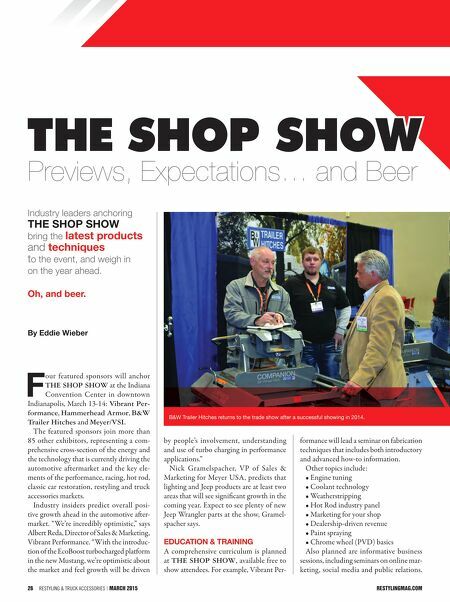 Previews, Expectations… and Beer Industry leaders anchoring tHE SHoP SHoW bring the latest products and techniques to the event, and weigh in on the year ahead. oh, and beer. 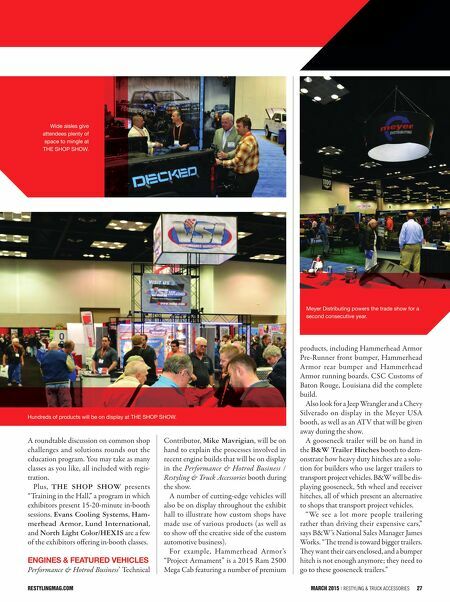 26 Restyling & tRuck AccessoRies | march 2015 restylingmag.com F our featured sponsors will anchor THE SHOP SHOW at the Indiana Convention Center in downtown Indianapolis, March 13-14: Vibrant Per- formance, Hammerhead Armor, B&W Trailer Hitches and Meyer/VSI. The featured sponsors join more than 85 other exhibitors, representing a com- prehensive cross-section of the energ y and the technolog y that is currently driving the automotive aftermarket and the key ele- ments of the performance, racing, hot rod, classic car restoration, restyling and truck accessories markets. Industry insiders predict overall posi- tive growth ahead in the automotive aer- market. "We're incredibly optimistic," says Albert Reda, Director of Sales & Marketing, Vibrant Performance. "With the introduc- tion of the EcoBoost turbocharged platform in the new Mustang, we're optimistic about the market and feel growth will be driven B&W Trailer Hitches returns to the trade show after a successful showing in 2014.